WANT TO KNOW ALL THE FACTS ABOUT THE COSTUMES IN THE "ASSASSINATION OF GIANNI VERSACE"? In this new episode of “Meet the Hollywood Costume Designers” Lou Eyrich had a chat with us about how she created the ’90s-era Miami “heat and sizzle” for the tv show The Assassination of Gianni Versace. Spoiler: it wasn’t easy at all! Bonus: Lou takes you to one of the most beautiful costume houses in Los Angeles. “It was a big challenge to find the right way to portray the Versaces” says costume designer Lou Eyrich. “It was intimidating to work on this tv show because I really did want to pay tribute to both Gianni and Donatella”. “This tv show” is American Crime Story: The Assassination of Gianni Versace, one of the most anticipated TV shows of 2018. And Gianni and Donatella are the Versaces. Really intimidating! The tv show tells the story of the death of Gianni Versace, killed on 15 July 1997 on the steps of his Miami villa, Casa Casuarina (where the crew was actually able to film). The all-start cast is alluring: Edgar Ramirez brings Gianni Versace to life on screen, Penelope Cruz is his sister Donatella Versace, Ricky Martin nails Gianni’s lover Antonio D’Amico and Darren Criss is the killer Andrew Cunanan. But the stunning costumes are the real star of the tv show, and it’s also because of the position officially taken by Donatella towards The Assassination of Gianni Versace: there was no help from the actual fashion house, which is not involved in the project. So Lou Eyrich had to face the biggest challenge of her career and it was not easy at all. Do you want to know what happened? Just watch this new episode of Meet the Hollywood Costume Designers we filmed in the amazing costume house Palace Costume & Prop in Los Angeles. VOLETE SAPERE TUTTO SUI COSTUMI DI THE ASSASSINATION OF GIANNI VERSACE? In questo nuovo episodio di Meet the Hollywood Costume Designers Lou Eyrich ci racconta come ha ricreato i costumi della “calda & sfrigolante” Miami degli anni ’90 per la serie tv The Assassination of Gianni Versace. Spoiler: non è stato facile e non ci crederete! Bonus: entriamo in una delle più belle costume houses di Los Angeles. “È stata una bella sfida cercare di trovare il modo di rappresentare al meglio i Versace” dice Lou Eyrich, “lavorare a questa serie mi ha messa in seria soggezione perché volevo assolutamente rendere omaggio sia a Gianni che a Donatella”. Questa serie televisiva è la serie più attesa dell’anno, The Assassination of Gianni Versace e Gianni e Donatella sono i Versace. Soggezione sul serio. American Crime Story: The Assassination of Gianni Versace racconta i fatti che gravitano intorno all’assassinio di Gianni Versace, freddato da due colpi di pistola dal serial killer Andrew Cunanan il 15 luglio 1997 davanti Casa Casuarina, la villa del designer a Miami (dove la crew ha tra l’altro girato). Il cast è stellare: Edgar Ramirez impresona Gianni Versace, Penelope Cruz è Donatella, Ricky Martin è il compagno dello stilista Antonio D’Amico e Darren Criss è l’assassino Andrew Cunanan. Ma sono soprattutto i bellissimi costumi i protagonisti di questa serie, grazie anche alla posizione ufficialmente presa da Donatella Versace nei confronti di The Assassination of Gianni Versace: la stilista ha negato qualsiasi aiuto della fashion house nella produzione, soprattutto nella realizzazione dei costumi. 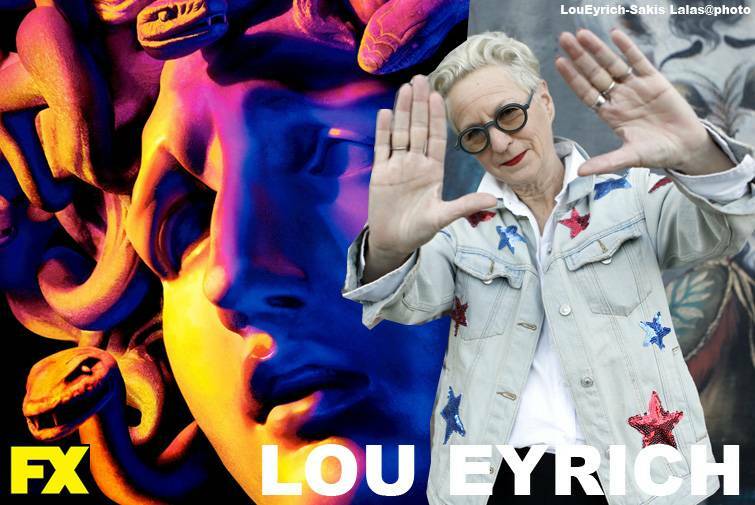 Così Lou Eyrich si è trovata ad affrontare la sfida più grande della sua carriera e non è stato per niente facile. Volete sapere com’è andata? Scopritelo in questo nuovo episodio di “Meet the Hollywood Costume Designers”, girato in esclusiva nella splendida costume house Palace Costume & Prop a Los Angeles.